She brushed her lips against the baby’s forehead and she saw his eyes fix on hers. ‘I am here.’ She touched his shoulders, his chest and felt his heartbeat against the tips of her fingers. It was then that her husband’s hand smashed hard and cold against her face. The child fell from her arms. She reached for him, but the room went dark and she was falling, and all she could see were William’s eyes burning and yellow. On a remote Kimberley station, Lady Emily Lidscombe gives birth to her first child, a child she hopes will provide an heir and perhaps breathe life into her ailing marriage. But the baby, when it is born, is not her husband’s: he has ‘skin the colour of dark mallee honey’, the result of a brief liaison with an Aboriginal stockman. The birth sets of a violent and disturbing chain of events and soon Emily is on the run with her maid, Wirritjil, across the stark but beautiful landscape as they avoid capture and retribution for crimes real and imagined. 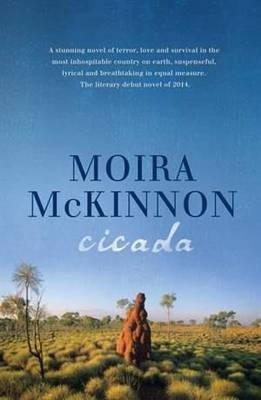 Cicada is a breathtaking tale of two disparate women who form a deep connection amidst horrible circumstances in a landscape which is as foreign to one as it is will be to most readers. This landscape is key to the story – it is a much a story of place as it is of violence, displacement and friendship. It is isn’t an easy read but it is compelling and utterly beautiful.